When you need to work at even greater heights, the danger of falling is even more serious. You need a recovery system that will not only stop your fall in time but also do so in a controlled way so that you will not be injured by the sudden breaking effect, which in itself can cause serious injuries, making escape or recovery even more difficult. The Abtech AB15 RT TORQ 15m fall arrest recovery device has been specially designed to protect the user from falls of greater height. 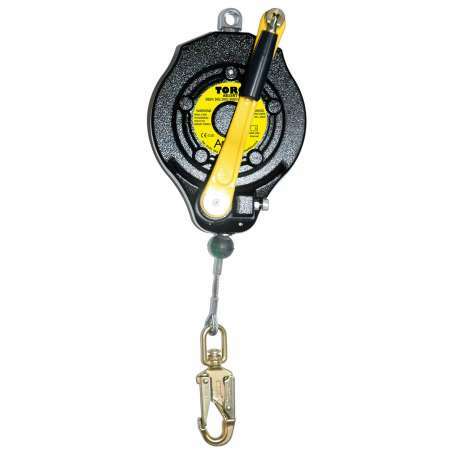 Designed to be anchored above the user allowing a safe working area, it features a retracting line that spools out or in in response to the user's movements. A purpose- designed brake will engage in the event of a fall and the user’s fall will be controlled by a purpose-built deceleration device. The AB15 RT allows the user who is positioned above the fallen user to winch him or her to a safer location. A specially designed swivel anchoring point is positioned on the top of the unit. It is compatible with the Abtech tripod and Davit arms to allow easy access and exit from dangerous or confined spaces. This unit is designed to be in full compliance with modern standards: BS EN 360 and BS EN 1496. The unit weighs 10.4 kg and the manufacturers recommend a maximum user weight of 150 kg. A service interval of 12 months is recommended by the manufacturer.